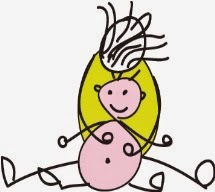 Bee pose for babies is an adaptation of buzzing bee breath. It is a type of relaxing, yogic breathing which is great for both babies and parents. Remember, when you are doing the pose with your baby, never force the movements and keep looking at your baby to make sure they are comfortable. 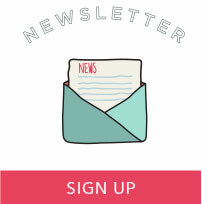 If you feel any resistance, or your baby becomes unsettled, stop. Once your baby has settled, gently try the pose again, perhaps making clicking sounds or using a toy to distract them. If your baby remains unsettled, do not persist with the pose. Instead ask your Baby Bumpkin teacher for advice. 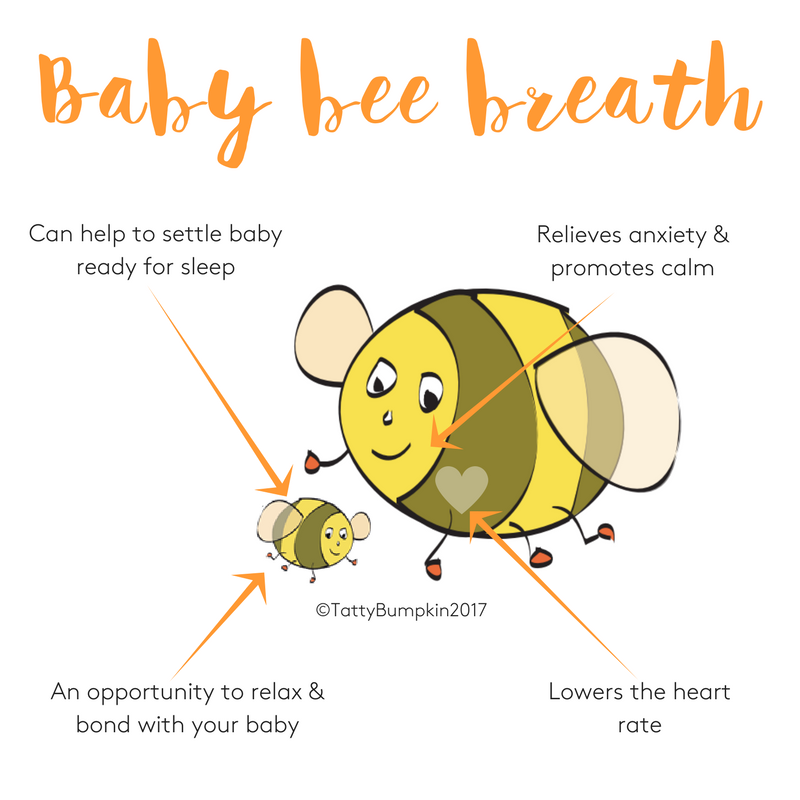 Practice bee breathing before you try it with your baby, so you can feel confident. 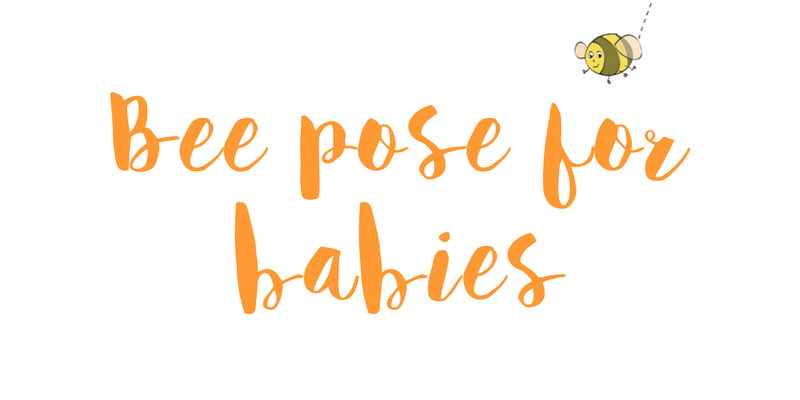 This adaptation of Bee pose is ideal if your baby is about 5-6 months or younger and has yet to gain good control of their head and body in a sitting position. However this adaptation can be used for babies of all ages if they are happy to lie on the floor (see picture). Settle with your baby on a mat or floor space, guiding them onto their back in front of you. If your baby is settled, and you feel confident, start by doing a couple of ‘bee breaths’ yourself. Ideally close your eyes as you do the breaths. Your baby will hopefully be listening to your humming sounds! Keep contact with your baby by resting your hands on their legs or body. Then open your eyes and gain good eye contact with your baby. Bend over your baby and gently lift up their arm or leg to ‘hum’ softly on their hand or foot. Make sure your baby can see their hand or foot and feel the vibrations of your ‘hum’. If your baby enjoys this sense of vibration, try gently ‘humming’ on their tummy, chest and maybe their forehead. Return to doing a few bee breaths yourself before ‘humming’ with your baby once more. Try this adaptation if your baby is about 5 months or over and able to sit happily on the floor, or on your lap either with support round their hips or lower body. Find a comfortable place to sit on the floor with your baby, settling them on the floor in front of you. They can lean back against you for support if they wish. 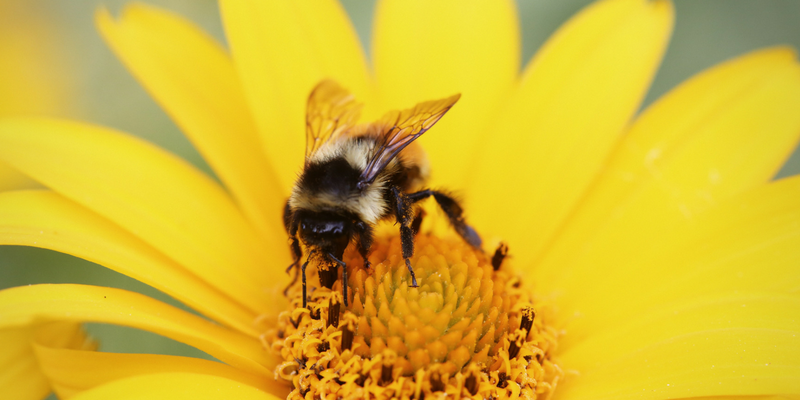 Start by doing the ‘Bee Hums’ of bee breath pose your-self. This will help you to slow your breathing and start to relax with your baby. Then take a good breath in and gently ‘hum’, as you breathe out, on the top of your baby’s head. Start gently at first. Then, if your baby seems to be enjoying the sensation, do louder, stronger ‘hums’ so your baby can experience more vibration. 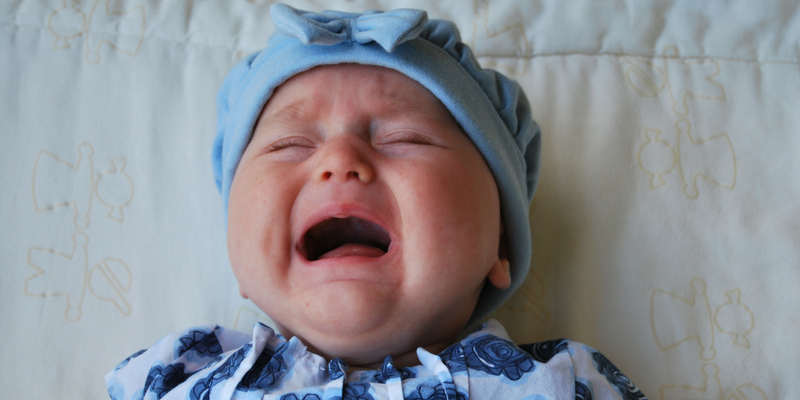 Research highlights the powerful effect of a baby’s cry on most adults, regardless of whether the adults look after children or not. Areas in our ‘mid-brains’ (associated with the ‘fight, flight and fright’ response) appear to be quickly activated when we hear a baby crying as opposed to any other man–made sound. Men produce more testosterone – this can lead to increased stress levels. Interestingly, fathers who are more involved with the care of their baby or child seem to produce less testosterone on hearing their cry – this may mean that they are less vulnerable to stress when coping with a crying child. Mothers release more cortisol – a hormone associated with the stress response. Researchers suggest that these changes in our body state may reflect an increased need to be ‘ready for action’ and more alert so that we can care for our baby or child in distress. However, over time, these responses can lead to an increase in our overall stress levels. In addition, babies and children will often naturally respond to their parent’s and carer’s ‘increased state of alertness’ by becoming more anxious themselves. They may start to breathe more quickly and perhaps cry more. And so the tension builds. As you take deeper, slower breaths in bee pose, concentrating more on the out breath, your heart rate will automatically decrease and this will hopefully lead to in an increased feeling of calmness. Lengthening the time you spend ‘breathing out’ in relation to the time you spend ‘breathing in’ reduces the ‘fight, flight and fright’ impulse described above – helping you to relax. You are wishing to settle them ready for sleep. Your baby or child is crying but they have been fed, changed and are clearly not in pain. As you slow your breath your baby will be encouraged to slow their breathing as well. Your baby will also enjoy the vibration sensations of Bee pose as they will have experienced similar sensations whilst in the womb.